The campus of IIM Rohtak is spread over 200 acres of land in the management city, Sunaria village. The campus is a green campus keeping in mind the safety of the environment and students are not allowed to commute inside the campus using vehicles. 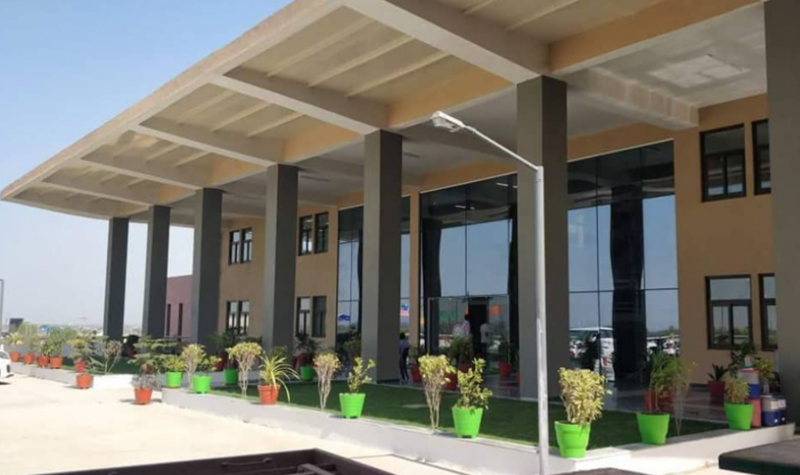 The Academic block and the Administration block are well furnished, and the IIM Rohtak logo has been set up at the top of the building which can be seen straight from the National Highway 10 on the side of which the campus has been established. After shifting to the new own campus of IIM Rohtak, students here get the freedom and flexibility to organize and conduct various events in the campus. The campus has lifts installed in the academic block as well as the hostels to help everyone. The hostels here have a dorm system comprising 12 dorms, each dorm having a flat system. The flats have either three or four room. Each room has a separate washroom which highlights the ample amount of facilities provided to each individual. The buildings in the campus are connected through a fiber optic backbone network which is controlled by the computer centre (IT Resources Centre).The centre also maintains other services like e-mail server, online learning system and intranet portal. The institute has a Finance Lab which is equipped with 12 Bloomberg Terminals. One of the unique aspect of this institute is the continuous effort to promote the gender diversity in the campus. Indian Institute of Management Rohtak has witnessed almost 51 per cent rise in the gender diversity of students. This year, out of 242 students enrolled in the PGP programme, 123 students are female which amounts to 51 per cent of the batch. This is more than 450 per cent rise in the number of female students as compared to the last year. The campus gives special attention to the medical and health facilities and to make sure that no one faces any difficulty in commutation from the campus to the main city, shuttle service has been provided by the authorities. We have been equally enamoured by the various guest lectures and management summits where the industry stalwarts address the students. The strategic location advantage to this campus provides ample opportunities to the students to gain academic and industry exposure. The company of Aditya Birla that I would like to work with is Ultratech Cement. The infrastructure industry in India is booming, and this impact is directly capitalized by the company, and I would like to be a part of this transition and like to contribute and learn my part on this. Having worked in a marketing firm I have a deep interest in marketing and branding and this is where I believe I would like to re-enter the industry in the domain with a company is a great competitor in the business.